An amusing fictional book, set in modern times, about a man obsessed with wartime Britain. 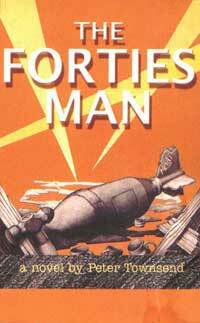 The Forties Man is a book which I would not have read had it not been drawn to my attention. I seldom find the time to read fiction but a novel which has as its main character a man who is obsessed with 1940's Britain was irresistible. In some respects I am perhaps the wrong person to review this book as I do feel a close affinity for the main character and at points wondered whether those of us fascinated by the 40's were being lampooned. I certainly began to wonder how others view our hobby. On the other hand, I can recognise some of the circumstances which occur to the characters and have to laugh at the accuracy. The Forties Man takes a light hearted look at the adventures of Trevor who is obsessed with Britain's war years and yearns to live in that era. Unfortunately for him he was born too late and is forced to live in the 1990's, much against his will. With the help of his friends, some of whom do remember the 1940's, Trevor embarks on a number of escapades culminating in the saving of his home town from an unexploded bomb, with only a stuffed dog and the spirit of the Blitz to help them. The book is amusing while making a serious point about the past. I did find the first couple of chapters difficult to get into but once I had got a little further I was more able to get to grips with the characters and I did enjoy it. The book is light reading. In places it made me laugh, in places it made me sad. I enjoyed it and would recommend it to those of you who have an interest in the 1940's and want a rest from the heavy historical text books and manuals I know we all enjoy.